Skoog has empowered many to play music for the first time, and can be life-changing for many. Today marks Global Accessibility Awareness Day (GAAD), a day which aims to get people discussing digital access and inclusion for people with different disabilities. 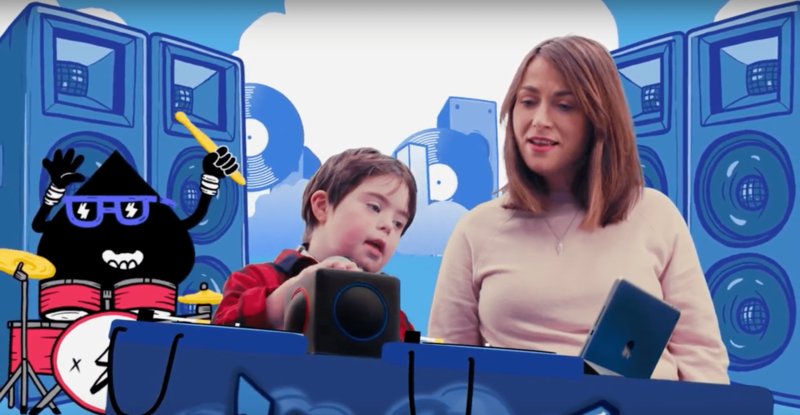 Skoog is groundbreaking in its accessibility, born from an Edinburgh University research project to design a musical instrument for those with differing educational and physical needs and abilities. The soft tactile cube shape of the Skoog is comfortable and easy to hold in the hand, on the lap, or can be mounted to enable wheelchair users or those with more limited mobility to play it. With five colored circles on five sides of the cube, playing the different notes of the Skoog is simple. Just pushing the button plays the note, removing any need for awkward hand positions, learning new breathing techniques, or holding a bow for stringed instruments. The simplicity of the different buttons is easy to understand and play. The Song Book play-along feature on the Skoog Music App uses big blocks of colour to show which one to play and when, meaning that users don’t need to read music, and can instantly pick up a Skoog and start playing. The Skoog Music App makes it easy to learn new and easily recognized songs. These are easy to play for musicians of all abilities and have different levels to progress over time. Skooging enables many children to express themselves, and share the joy of creating music with others. Many children with Special Educational Needs (SEN) can struggle to build social bonds, or express their emotions. The Skoog is easy to pick up and play together and provides a way of forging those important connections and spending time as a family or with friends. Rest assured that the Skoog is born from several years of innovation, research, trial and error. The Skoog was born from a study conducted at the University of Edinburgh, which researched a multitude of aspects important for creating an accessible musical instrument. These were incorporated into the design of the Skoog after an extended research and development phase. It has been tried and tested with young people with SEN in families and with music therapists all over the country, who time and time again report the overwhelmingly positive change it has brought to the lives of young people. Versatility is the Skoog’s middle name. It has something for everyone. It has easy nursery rhymes and popular songs for beginners to play along to when they are just starting out. As ability improves, it can be connected to Spotify, so users can play along to their favourite songs with the Skoog. They can connect it to Garage Band and create and record their own music, choosing from a wide range of instrument sounds. The Skoog is even being used to teach coding, an essential skill for young people in today’s world. There is something for everyone, making it a valuable investment in a child’s musical and educational development, as well as their ability to experience the wonder of creating music.